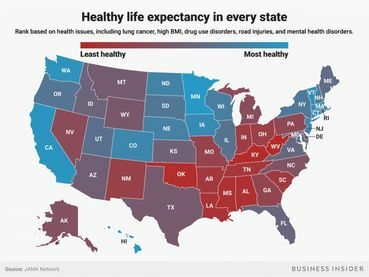 Yup those red republican states are worse off!!! I won the toss ,I was first in to bat for a change.Thanks for the information Animae.I am surprised that the life expectancy.is only 79.I thought it would be higher.Luckily ours is. Yes Walter, but that's because we have healthcare for all in Australia!! "Average life expectancy in Australia hits new record high!! The latest figures from the Australian Bureau of Statistics - life expectancy hit a new record high in 2015. Babies born in 2015 expected to live to 80.4 years if they are male & 84.5 years if they are female. USA expects 76 years for males & 81 years for females. UK expects 79 years for males & 83 years for females. New Zealand expects 80 years & 84 years respectively. China’s life expectancy is 74 for males & 77 for females. Russia, life expectancy is just 63 years for males & 75 for females. Interesting. .Thanks for the information..
We do live long in MN. Most of my relatives lived up into their 90s. noted not sure on the accuracy?????? Thank You. Of course, the data was taken before the article came out. Things change.